The Veterans' Day Program is always a special evening at the Rotary Club of Leesburg. The Nov 12th event was another memorable celebration and remembrance of the military men and women who served our country. Master Gunnery Sergeant Chris Stowe, a bomb disposal expert who serves in the Marines, provided a heart-felt and inspiring program about the value of service. He told stories about and expressed appreciation for all that the men and women of the military have done to protect our freedom and help others in everyday life. 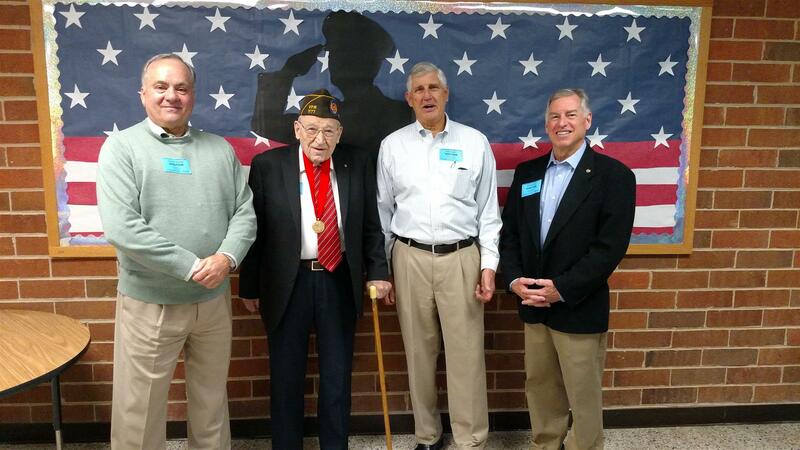 Another special Rotary event was the annual Veterans' Day Visit to the Leesburg Elementary School. Second graders get a chance to interact with several Rotarian veterans in a "show and tell" event. Our club veterans were warmly welcomed, and the students had great questions, especially for our WWII veteran Stanley Caulkins, who was part of the group. Thanks again to teacher Karen Hampton for initiating this annual event.